Chitral| Archaeologists excavating at a prehistoric site in the Hindu Kush mountains, have discovered what could be the most ancient proof of intentional use of a psychoactive substance by humans. While searching the site of a Paleolithic settlement estimated to be 120 000 years old, scientists discovered seeds, resin and ashes, associated to the indica subspecies of the cannabis sativa plant. A chemical analysis executed on a small pottery jar found in the tomb of what seems to be a local chieftain or shaman, revealed that the vessel contained cannabis resin, also known as hashish, suggesting the plant was also associated with burial ceremonies and possibly other sacred rituals. A wide variety of different Tools have been found on the site, including hand axes, knives, scrapers, spear points, sickles and querns. 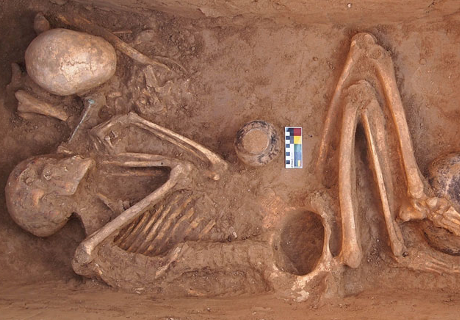 The oldest evidence of the inhalation of cannabis smokes known before the discovery of this new site, is to be found in the 3rd millennium BCE, as indicated by charred cannabis seeds found in a ritual brazier at an ancient burial site in present day Romania. In 2003, a leather basket filled with cannabis leaf fragments and seeds was found next to a 2,500- to 2,800-year-old mummified shaman in the northwestern Xinjiang Uygur Autonomous Region of China. Evidence for the consumption of cannabis has also been found in Egyptian mummies dated about 950 BC. Cannabis is also known to have been used by the ancient Hindus of India and Nepal thousands of years ago. The herb was called ganjika in Sanskrit. 5 Comments on "Pakistan: Cannabis Discovered in Prehistoric Tomb"
Is that a pack of Zig zags next to him? Most caves in the Middle East been lived in for a grip. It’s hard to pick apart the layers when it’s been a home for tens of thousands of years. It ain’t 120000 years ago though. It’s 12000 years ago. The last glacial period evolved humans. We came out of it smart and ambitious enough to domesticate plants and animals for the first time. And of course big doobies!